Handfasting charms, memorial tiles (like those created by our lovely team member Kari of DelaneyJewelry.Etsy.com) can be added to the fringes of the handfasting ribbons or cloth. Rebekah and Thomas have chosen to use a hand fasting in their wedding ceremony to emphasize their eternal bond and reinforce the feeling that they never wish to be parted from one another. Hand fasting is an ancient tradition symbolizing the binding together of two people in love. Tying the Knot. This cord was created with the ribbons, on which are written the thoughts, hopes, well wishes, and blessings of friends and family for Thomas and Rebekah as they begin their union as husband and wife. It will bind Thomas and Rebekah together with the strong bonds of love. These are the hands of your best friend, young, strong, and full of love for you. These are the hands that are holding yours on your wedding day as you promise to love each other today, tomorrow, and forever. These are the hands that will work along side yours as together you build your future. These are the hands that will passionately love you and cherish you through the years and with the slightest touch will comfort you like no other. These are hands that will countless times wipe tears from your eyes, tears of joy and tears of sorrow. These are the hands that will tenderly hold your children and grandchildren. These are the hands that will help hold your family together as one. These are hands that will give you strength when you need it. These are the hands that even when wrinkled with age will still be reaching for yours, still giving the same unspoken tenderness with just a touch. Remember then, as your hands are fasted, these are symbols of the relationship you share. Bride and Groom’s hands are bound and the officient follows with a prayer. If you recall, the last time we chatted, Alice was falling, falling, falling down the rabbit hole. It wasn’t long after she hit bottom that she found herself swimming in her own tears along with “a Duck and a Dodo, a Lory and an Eaglet, and several other curious creatures.” Once clear of the water the Dodo recommended they dry off by means of a “Caucus-race.” What followed was nothing short of a running circus sideshow containing any number of bird species. Cut to today – your wedding day! You know you’ll be racing hither and thither so why not own it with your version of a Caucus-race? Start with a whimsically romantic, spiraling race course – er- aisle. For the reception, I love the idea of decorating with birds. I’m not talking Hitchcock-ian, Poe-ish, or even Portlandia birds. I’m talking flights of fantasy, Wonderland birds. Imagine spending your first evening as a married couple under a sky of swirling birds. For a more subtle take, consider Terryn + John’s bohemian look featured on Green Wedding Shoes. I adore these moss-filled ravens, available in several colors, from our own Teresa Kessler! Imagine them nestled amongst greenery throughout your reception site! 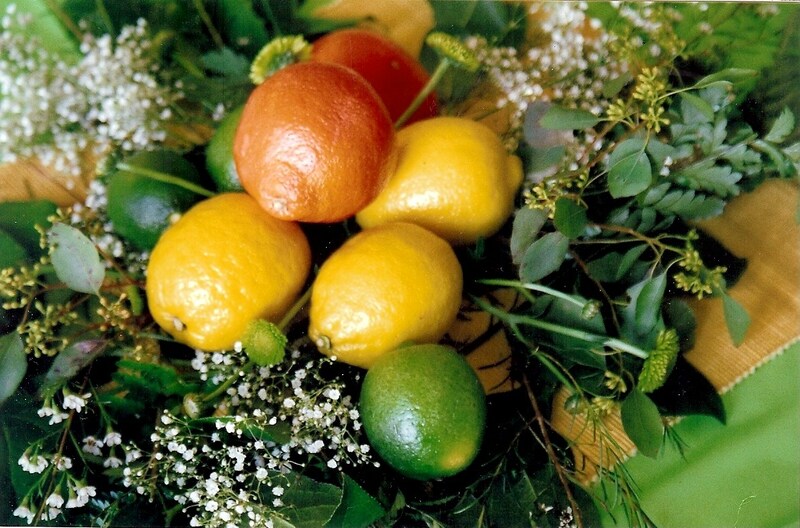 A little bit of Citrus for your wedding. Karen over at FeltNatural has created our latest treasury “What a horrible thing yellow is¨- Edgar Degas. I think we showed him! This treasury is about as creamy as a lemon meringue pie! Ideas for Tropical Wedding that is Tiki inspired! Although the ethereal grace of white weddings in the West has always been a favorite adopted by many, it does not quite equal the passion & romance of marrying in red! Perhaps the most opulent of Red Weddings has to be those in both China & in India, who prize the color and believe it attracts happiness, luck & good fortune. In fact, the Indian bride traditionally wears a red dress & veil, but will also have red henna designs with hidden romantic messages or auspicious symbols for her husband to read during their wedding night painted all over her body. Instead of being carried over the threshold, the bride will partake in a ritual in which she dips her feet in red colored water and then walks barefoot through her new home – a custom symbolizing her new role as a married woman. Reception. Some even have changes of gowns during the reception just for fun. Inspired by these traditions here are some Red Hot creations by the Wed Eclectic team to set your wedding day ablaze! We often think veils as being the wedding headdress worn by the brides but it made me wonder, what do other countries and cultures (past and present) wear for their weddings? The mang tikka is the piece of jewellery that hangs on the forehead of a hindu bride. I can imagine some of these mang tikka can get very heavy but what a way to wear something as pretty as a mang tikka. Khan Dong is a coil of very stiff brocade fabric that is worn by the bride. It is worn just like a crown with your hairstyle poking through the middle so perfect for brides who are planning to wear a fancy hairbun. If you feel the men are left out, don’t worry, there is a version for them as well but it is not as big and fancy as the brides. The wataboshi can be a hood or a strip of white cloth which is supposed to hide the “horns of jealousy” until the couple is married. What these horns can be, I do not know but like the veil, it is very simple and chic. Korean brides if they are wearing a traditional hanbok wedding dress will wear a Jokduri or Hwagwan. This is a crown that sits at the front of the head, I think the crown is held on by strings that are tied at the base of the head. From what I have read the jokduri and hwagwan are very similar in shape except the hwagwan is decorated more heavily like the picture below. This is something from the past and I wish it came back in wedding fashion. This headdress was once worn part of everywear for Russian women and of course weddings as well. Tradition states that if you were a girl or unmarried lady you would wear one showing off your hair but once you were married, you would then wear a veil with it. I remember my mother telling me that when my great grandmother got married she wore a bridal crown but of course we don’t have any pictures of this and it was a long time ago. Nowadays, most Chinese brides will only wear these at wedding photoshoots rather then at their actual weddings. However there has been a hanfu movement and some couples are wearing them for their wedding. This one I would love to try my hands on because I am fascinated by how the fabric seems to defy gravity! And it is not just the bride who wears ones, this headdress is worn by all females and I think the rule is the bigger the better. Every lady has their own way of styling their gele and if you hop onto YouTube, there are a lot of videos on how to tie a gele. Do you have any other wedding headdress you would like to share with us? She creates fabulous hairpieces and hair accessories! 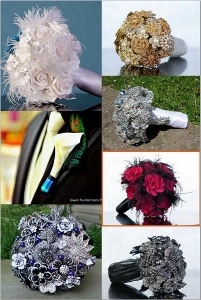 They would be perfect accessories for your unique wedding, for events, or for wearing everyday. She is offering a $30 gift certificate to her shop…! This giveaway will run until midnight, May 31st, but don’t wait!